The 3M™ 7850 Electrically Conductive Acrylic Pad (eCAP) 7850 is an electrically conductive double- sided PSA tape and conductive gasket designed for EMI/RFI shielding and EMI/RFI gasket to metal surfaces. The 7850 eCAP product consists of a 150µm thick acrylate adhesive layer, filled with carbon particles that allow for both good heat transfer and electrical continuity between substrates through the acrylate adhesive layer, and additionally provides electrical continuity in the plane of the adhesive. The acrylate adhesive layer is protected by silicone-treated PET film release liners, 50µm thick on the face side and 75µm thick on the back side. A diagram depicting the layers of the 7850 material is shown in Figure 1. 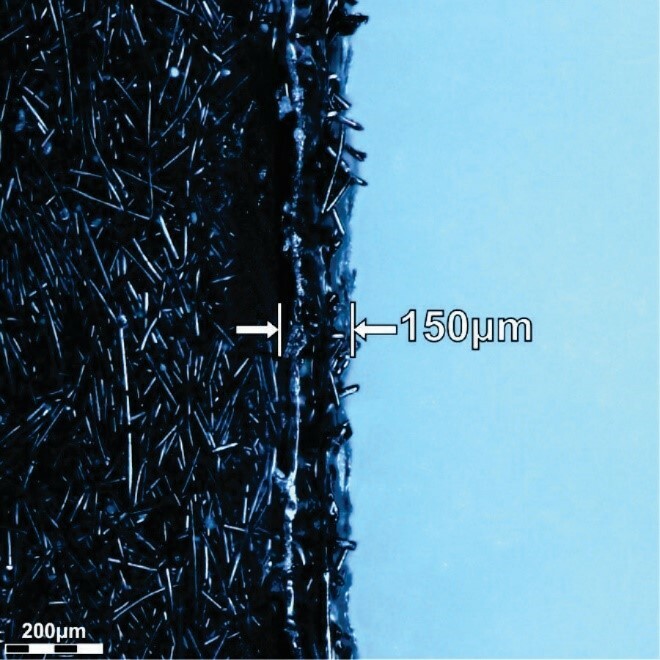 Figure 1.7850 eCAP diagram showing the silicone-treated PET release liners located on top (50µm) and bottom (75µm) of the acrylate adhesive layer (150µm). 3M eCAP materials are flexible adhesive tapes. The delicate tacky nature of these materials makes them difficult to process, resulting in deformation of the materials when processed with traditional mechanical methods. The non-contact nature of laser processing overcomes this difficulty, allowing the processing of applications with fine geometry and intricate detail. 3M eCAP materials are only suitable for laser cutting that produces smooth processed edges and minimal heat-affected zones, without degrading the physical properties of the materials. Other laser processes are not suggested as they are not conducive to the intended use of these materials. Universal Laser Systems makes it simple to consistently and repeatedly process these materials to a high degree of dimensional accuracy because the non-contact nature of laser processing eliminates material deformation during processing. 3M 7850 eCAP was tested to assess laser processing compatibility and determine the best system configuration of laser peak power and wavelength. The PET liners absorb 9.3µm energy more efficiently than other wavelengths, meaning less peak power was necessary to produce good results with minimum heat affects. The acrylic adhesive layer also absorbs the 9.3µm wavelength efficiently with clean edges free of heat affects along the processed path. Microscopy images taken at 200x magnification of the processed edge of the 7850 post-processing, with the liners in place and the liners removed, are shown in Figures 2 and 3, respectively. These images show that the PET liners contain most of the heat affects and discoloration, while the acrylic adhesive layer itself is relatively free of heat effect and discoloration. Figure 2. Microscopy image (200x) of the laser- processed edge of 3M eCAP 7850 with the PET liners in place. The heat-affected zone measures 150µm. Figure 3. 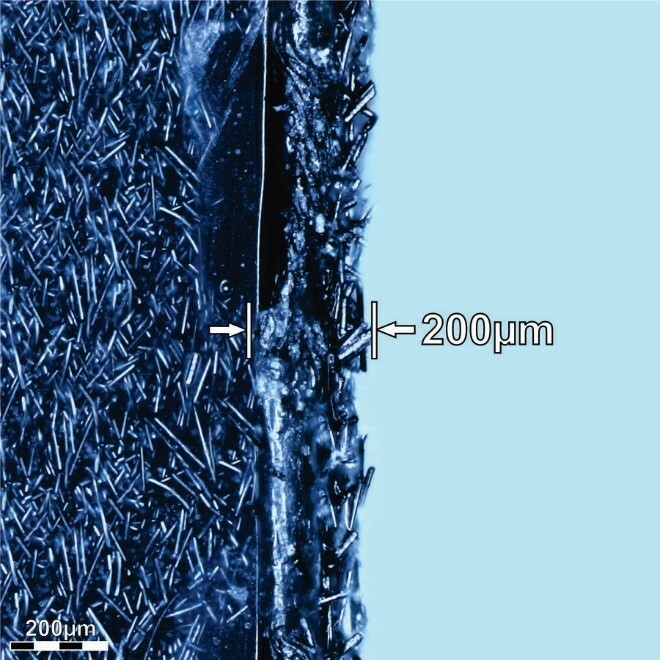 Microscopy image (200x) of the laser- processed edge of 3M eCAP 7850 with the PET liners removed from the material. The heat- affected zone measures 90µm. 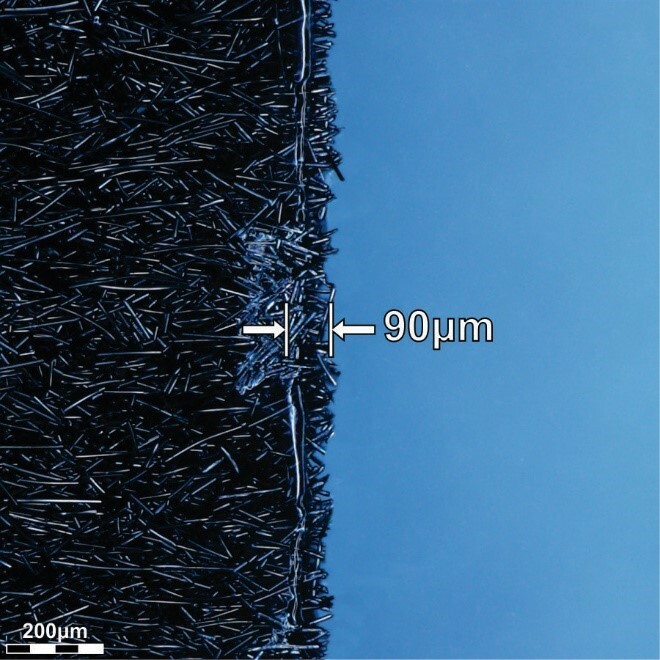 Further inspection of the laser-processed material shows that the acrylic adhesive layer is cleanly processed with the 75 watt 9.3µm CO2 laser source and the carbon fibers in the material are more efficiently cleaved along the processed edge by the addition of the 1.06µm laser energy. Figures 4 and 5 depict 3D-rendered microscopy images of the processed surfaces shown in Figures 2 and 3. 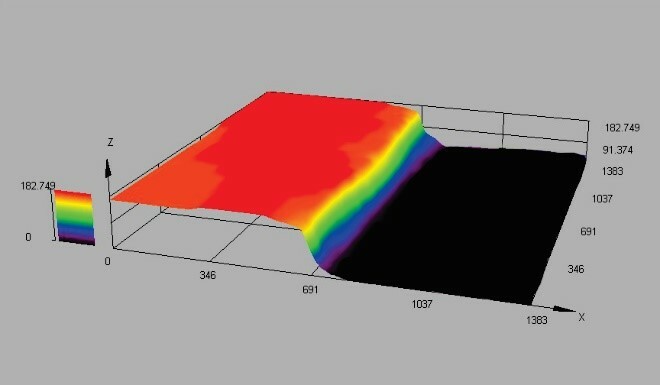 Figure 4 depicts how the PET layer reacts to the laser energy by forming a “wave” of melted material along the top surface of the processed edge. In Figure 5 the PET liners are removed from the material, showing the smooth flat surface and processed edge of the acrylic adhesive layer, free of adverse heat effects. Figure 4. 3D-rendered microscopy image (200x) of the laser-processed edge of the eCAP 7850 with the PET liners in place. Figure 5. 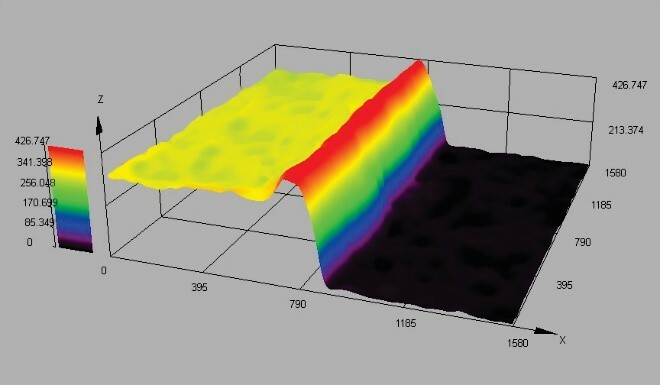 3D-rendered microscopy image (200x) of the laser-processed edge of the eCAP 7850 with the PET liners removed post-processing. 3M™ 7850 eCAP was also tested with an alternate system configuration of 10.6 micron laser energy for comparison and determination of the effectiveness of each system configuration. The results of these tests were compared by analyzing the heat effects, quality of the processed edge, and post-processing requirements. The results of the comparison of these system configurations are listed in tabular form in Table 1 and are shown photographically in Figure 6a and Figure 6b. Both system configurations appear viable, with some reduction in quality of the results for the 10.6 micron configuration as stated in the comparison. Figure 6a. Comparison microscopy image (200x) of the processed edge resulting from 9.3 micron processing.The PET liner was left in place. Figure 6b. Comparison microscopy image (200x) of the processed edge resulting from 10.6 micron processing. The PET liner was left in place. 3M eCAP adhesive tape applications requiring fine geometry and intricate detail without degrading the physical properties of the material can be achieved with Universal Laser Systems technology. 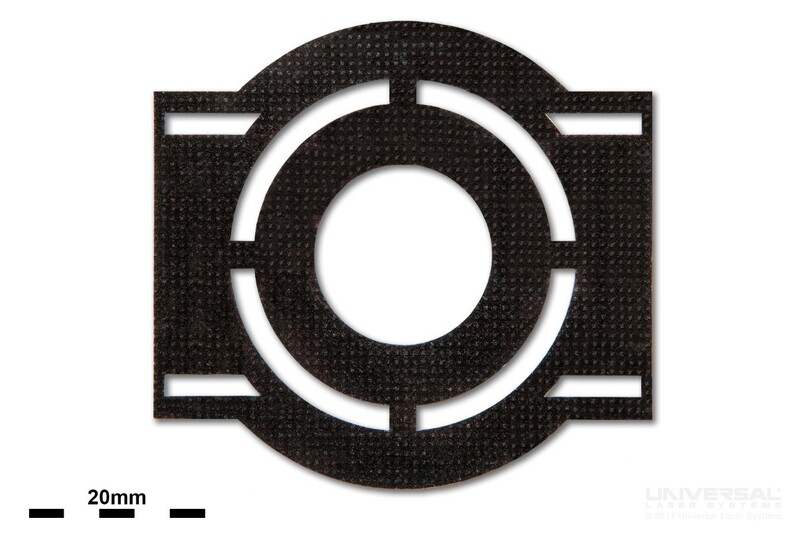 An example demonstrating the results of laser cutting the 3M eCAP 7850 material is shown in Figure 7. Figure 7. Example of laser cutting 3M eCAP 7850. 3M 7850 eCAP is suitable for laser processing and was extensively tested to determine the most efficient processing configuration. Through this testing, it was determined that laser cutting is viable with this material and that a 75 watt 9.3 micron CO2 laser source is the best wavelength and power configuration for the processing of this material. The PET liners and acrylic adhesive layer efficiently absorb the 9.3 micron wavelength laser energy, and, coupled with the peak power of the 75 watt laser source, produce a clean smooth processed edge that has a minimal heat-affected zone and discoloration. Other materials in this eCAP product line are expected to process similarly.